I have a Libreoffice Calc spreadsheet that holds around fifty sheets (each one with no more than a dozen valued rows); this is good for data organization — each sheet holds a sequence of events and costs for a different object — but awful for PDF or printing, since each sheet is printed on a different page, ending up with lots of pages blank for the most part. Is there a way to print more sheets per page? This should be a program setting or similar, as each sheet should "follow" the preceding one, like they were tables on the same sheet. You don't mention whether you're on Mac, PC or some other OS. In Windows, many printer drivers can print multiple pages per sheet of paper and/or print two-sided. I don't have the Mac handy, so can't check that at the moment. Adobe's free PDF reader can also print multiple pages per slide, which takes the whole printer driver issue out of the question. 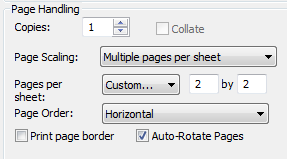 In the print dialog's Paper Handling section, choose Page Scaling: multiple pages per sheet, then choose Pages Per Sheet to set the number of pages you want to print. Put all valued rows in one sheet, and add a column to indicate which sheet name it is. And then use a column Filter to be able to view each set of values (same as you would now switch between sheets), and just do away with the fifty separate sheets. Or, write a BASIC macro to compile one big printer-friendly sheet, containing the valued rows of all sheets. Not the answer you're looking for? Browse other questions tagged printing libreoffice openoffice openoffice-calc or ask your own question. How NOT to print sheet name and page number in OpenOffice.org Calc? How to print 8 copies of a one page LibreOffice document to 2 sheets of paper? OpenOffice/LibreOffice Calc how to not print column but show it in sheet?